Does having one IV not perfect greatly effect the combinations of Destiny Knot? I have two 5 IV Absol in the Daycare One Holding The Everstone for Jolly/ and the other is holding Destiny Knot. Now for the past hour I've been getting 4IV babies. I thought the 5IVs between the 12 will be passed on to the baby. In my head I thought the Destiny Knot would have the IVs side by side and pick between the same stats. Like it's picking the HP IV so it chooses between both HP IVs and holds one of them for the baby and then on to the next stat. Or does Destiny Knot work in combinations (Which i'm starting to believe) It scrambles the 12 IV Stats and randomly Picks 5 IVs from the pile. Is that how it works? The first Riolu is the case where all IVs transfer perfectly. 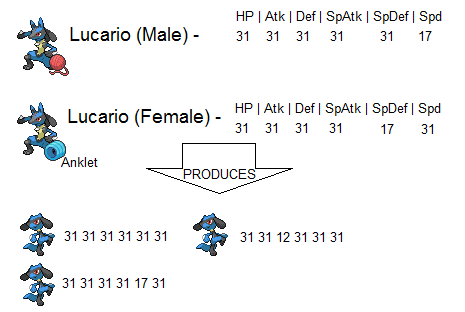 The second Riolu is where the Female's SpDef is transfered. The third Riolu is the case where the IVs of HP, Atk, SpAtk, SpDef, and Spd were transferred leaving the Def IV up to randomly being selected. but, I've been getting 4IV Babies. Is that just Bad Luck? Having perfect Iv worth it? Destiny Knot - does it take IVs from both parents?